It’s absolutely shameful that most people living outside Yorkshire, or with no interest in cycling, would be clueless as to who Beryl Burton was. Beryl is one of our forgotten women heroes. Arguably the greatest sportswoman in the world – ever – and almost no-one knows anything about her. 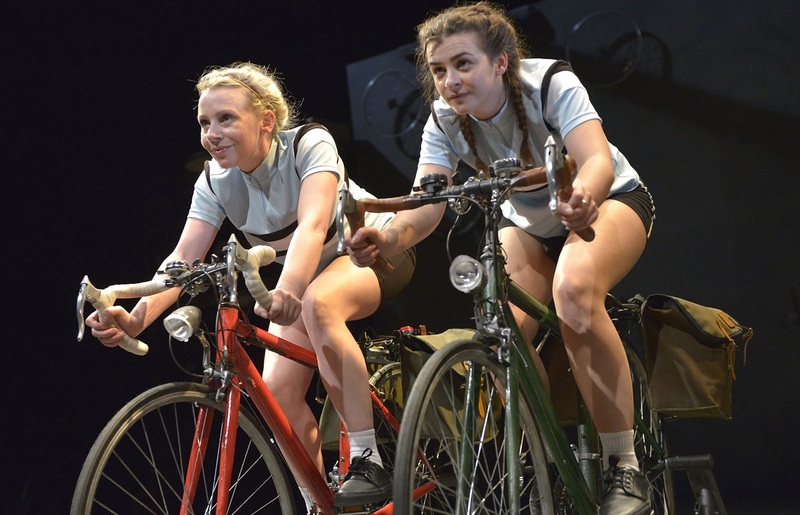 Back in 2014, with the Tour de France starting in Leeds, the West Yorkshire Playhouse commissioned Beryl and one of our top stage and screen actresses, Maxine Peake, was asked to expand her début radio play about the cycling legend, for the stage. 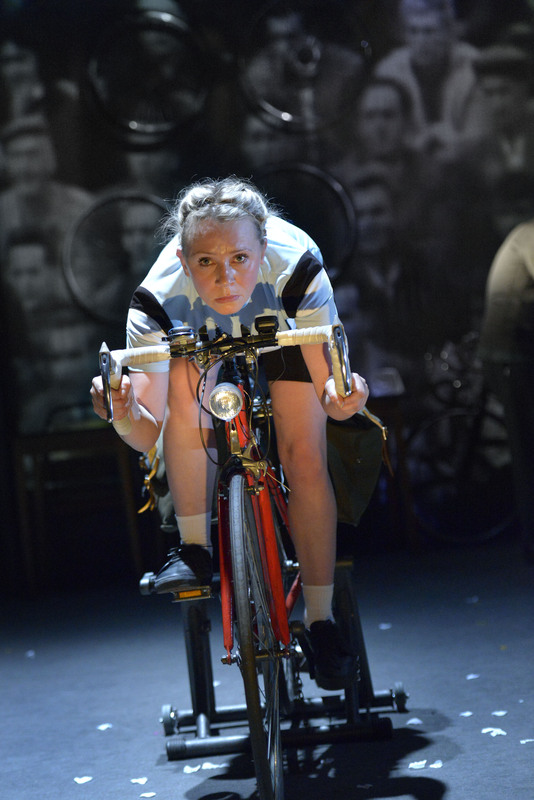 Beryl proved a tour de force and is now revived at Kingston’s Rose Theatre. It’s an enthralling and inspirational story about a remarkable woman who defied the odds to become a champion and who reigned supreme for an astonishing 25 years. 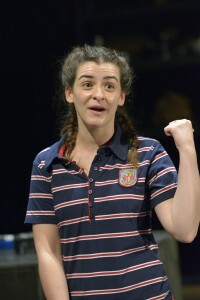 Director Rebecca Gatward describes Beryl as a “modest show about a very modest woman.” She does herself a disservice. This is a story about a truly incredible woman who showed, through grit and determination, that anything was possible and Gatward excels in presenting the tale in an inventive and original way. 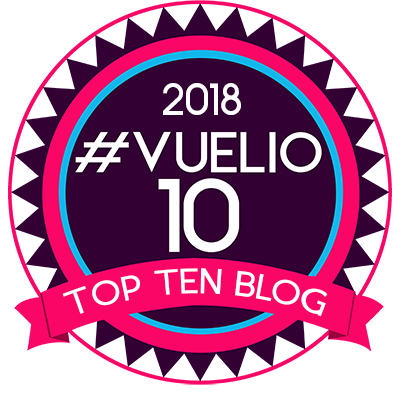 How can you tell a story about a cyclist, who thought nothing of pedalling from Yorkshire to Ireland for her hols and who competed in world championship events, without a bit of biking on stage? Designer Naomi Dawson stepped up a gear to come up with the answer. Beryl breaks through the fourth wall to allow its cast of four to interact with the audience. “There are some of you out there who have never heard of Beryl Burton, the greatest sportswoman who ever lived,” says actor Dominic Gately, who plays a number of supporting characters. “I had never heard of her until I got this job!” Says Lee Toombes, who chiefly plays Beryl’s long-suffering but very supportive husband Charlie. But over nearly two hours we get to know Beryl rather well and what an amazing story unfolds. Peake has written a thrilling story and one filled with gritty Yorkshire humour. There are a couple of political rants about sexual inequality in sport but the writer has a fair point. There were gasps from Saturday’s audience when they learned that women’s cycling wasn’t admitted to the Olympics until as late as 1984. There had been no sponsorship or financial backing and we see Beryl return triumphant from the world championships with a gold medal around her neck – only to hitch a ride back home. As a ten-year-old Beryl collapsed and spent two years recovering from rheumatic fever. She was told that she mustn’t exert herself or do any strenuous activity because her heart might not take the strain. She was horrified. “ A future of disappointment and disillusionment!” She furiously wailed. Five years later she started work and met her future husband, Charlie, who was a keen club cyclist and who introduced her to two wheels. From then on there was no stopping her, not even an irregular heartbeat which was a ticking time bomb throughout her life. Beryl’s drive and iron will left little room for anything else in her life. There is little doubt, in Peake’s play, that motherhood wasn’t a top priority. The couple’s one child, Denise, spent her early years strapped into a sidecar and dragged around various cycling events. And, although Gatward describes Beryl as a very modest woman, she’s depicted here as having a huge ego. The Yorkshirewoman throws an almighty strop when her supremacy in the sport is threatened by her own daughter – and it nearly kills her. The cast of four do an astounding job, taking a variety of roles throughout Beryl’s life, and frequently pedalling furiously on static bikes. Samantha Power, who primarily plays the opera-loving sporting legend, has said that she rides about six miles a day – without moving an inch. By the end of the run I imagine Power, Lee Toombes, Rebecca Ryan and Dominic Gately will be fit to drop with mighty calves like Bradley Wiggins. Power’s very physical performance is fearless, bold and athletic, presenting us with a down-to-earth, single-minded woman, with a superhuman ability. The indomitable Burton led her sport for 25 years, dying from a heart attack as she cycled to deliver invitations to her 59th birthday party. The stage fills with trophies of all shapes and sizes as the cast give a roll call of her achievements – national and world records that she held for decades – and it’s deeply moving. Today cycling is a growth sport with more than five million people taking to two-wheels either for pleasure or competition – there are more than 1,700 cycling clubs – but it is still a pursuit dominated by men. If ever there was a story to inspire women to get on their bikes it is this. Beryl plays at Rose Kingston until this Saturday. Get a wiggle on and book a ticket. 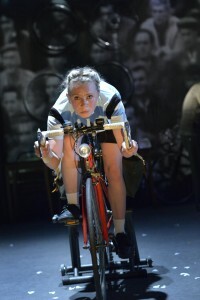 Maxine Peake’s début play, Beryl, is a tour de force, an enthralling, inspirational, heartwarming story about our greatest sportswoman, Beryl Burton.